This privacy statement applies to the Hawaii State Legislature Website, www.capitol.hawaii.gov, operated jointly by the Hawaii State Senate and House of Representatives. 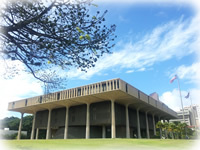 The Website is designed to promote open access to information and records of the Hawaii State Legislature and its members. The Website has been designed to minimize the need to provide personal information as a condition to accessing information and services available on the website. Some services, such as personalized email delivery of hearing notices, require that the person using the Website submit some personal information such as the person's email address. The personal information of persons accessing the website for information and services is stored in a protected manner and is not disclosed. Personal information, namely a user's name and email address, is required to submit testimony through the Legislature's website to ensure that testimony is being submitted by a real person and not an automatic generator. A person may also elect to provide additional personal information, such as contact information, when submitting testimony. Persons submitting testimony through the Website should be aware that, in order to preserve the integrity of the testimony, the content of testimony is not altered or changed in any manner before publication. Any personal information that is contained within the testimony will not be redacted or otherwise altered and will be published to the Website. The Legislature does not intend for any personal information gathered through the website to be disseminated or made available to a third party and the Legislature will not sell or otherwise make any personal information available for commercial purposes. However, the legislative process is a public process.